The life of wild animals is a struggle for existence....It seems evident that what takes place among the individuals of a species must also occur among the several allied species of a group,- viz., that those which are best adapted to obtain a regular supply of food, and to defend themselves against the attacks of their enemies and the vicissitudes of the seasons, must necessarily obtain and preserve a superiority in population; while those species which from some defect of power or organization are the least capable of counteracting the vicissitudes of food, supply, &c., must diminish in numbers, and, in extreme cases, become altogether extinct....But this new, improved, and populous race might itself, in course of time, give rise to new varieties, exhibiting several diverging modifications of form, any of which, tending to increase the facilities for preserving existence, must by the same general law, in their turn become predominant....Even the peculiar colours of many animals, especially insects, so closely resembling the soil or the leaves or the trunks on which they habitually reside, are explained on the same principle; for though in the course of ages varieties of many tints may have occurred, yet those races having colours best adapted to concealment from their enemies would inevitably survive the longest....We believe we have now shown that there is a tendency in nature to the continued progression of certain classes of varieties further and further from the original type. In his book “Of Miracles and Modern Spiritualism,” which can be read here or here, Wallace had a chapter entitled, “The Evidence of the Reality of Apparitions." On page 69 he began the chapter by stating, “I now propose to give a few instances in which the evidence of the appearance of preter-human or spiritual beings is as good and definite as it is possible for any evidence of any fact to be.” Wallace discusses on page 70-71 a ghost story he read about and found compelling. A man saw a strange figure, and pointed it out to another man who identified the figure as his brother who lived far away. The figure disappeared. Word later came that the brother had died at the same hour and day as the strange figure was seen. However much any one of these incidents might have been scouted as a delusion, what are we to say to the combination of them ? A whole household hear distinct and definite noises of persons walking and speaking. Two ladies see the same appearances, at different times, and under circumstances the least favourable for delusion. The name is given to one by voice, to the other by writing; the date of death is communicated. An independent enquirer by much research, finds out that all these facts are true ; that the christian name of the only " Children " who occupied and died in the house was Richard, and that his death took place in the year given by the apparition, 1753. Mr. Owen's own full account of this case, and the observations on it should be read, but this imperfect abstract will serve to show that none of the ordinary modes of escaping from the difficulties of a " ghost story " are here applicable. Wallace's conviction about the reality of ghosts came before there was even published the most compelling work on the topic, the massive and thoroughly researched work "Phantasms of the Living" by Gurney, Myers and Podmore, which can be read here. Wallace's eyewitness reports of ghost sightings appeared in Chapter 37 of Volume 2 of his biography “My Life.” You can read his original accounts by using this link, or this link (to get the text version), and going to page 327. 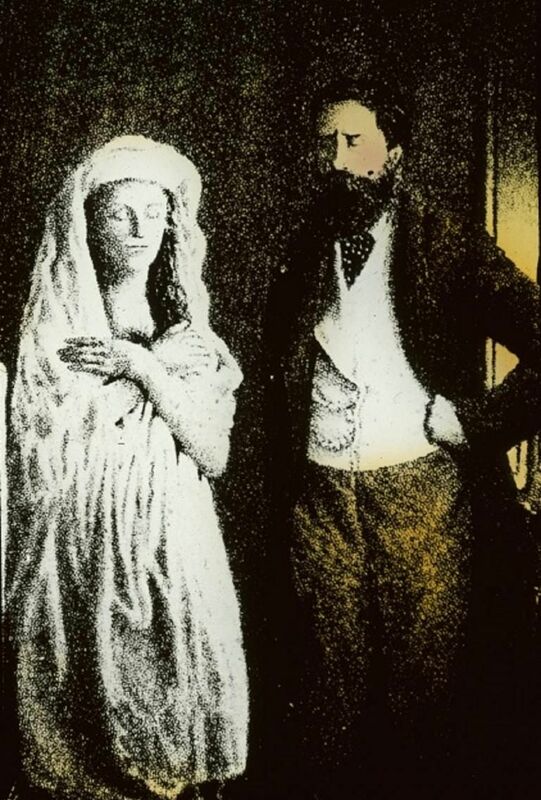 I attended a series of sittings with Miss Kate Cook, the sister of the Miss Florence Cook, with whom Sir William Crookes obtained such very striking results. The general features of these séances were very similar, though there was great variety in details. They took place in the rooms of Signor Randi, a miniature painter, living in Montague Place, W., in a large reception-room, across one corner of which a curtain was hung and a chair placed inside for the medium. There were generally six or seven persons present. Miss Cook and her mother came from North London. Miss C. was always dressed in black, with lace collar, she wore laced-up boots, and had earrings in her ears. In a few minutes after she had entered the cabinet, the curtains would be drawn apart and a white-robed female figure would appear, and sometimes come out and stand close in front of the curtain. One after another she would beckon to us to come up. We then talked together, the form in whispers; I could look closely into her face, examine the features and hair, touch her hands, and might even touch and examine her ears closely, which were not bored for earrings. The figure had bare feet, was somewhat taller than Miss Cook, and, though there was a general resemblance, was quite distinct in features, figure, and hair. After half an hour or more this figure would retire, close the curtains, and sometimes within a few seconds would say, "Come and look." We then opened the curtains, turned up the lamp, and Miss Cook was found in a trance in the chair, her black dress, laced-boots, etc., in the most perfect order as when she arrived, while the full-grown white-robed figure had totally disappeared. It was a bright summer afternoon, and everything happened in the full light of day. After a little conversation, Monk, who was dressed in the usual clerical black, appeared to go into a trance; then stood up a few feet in front of us, and after a little while pointed to his side, saying, "Look." We saw there a faint white patch on his coat on the left side. This grew brighter, then seemed to flicker, and extend both upwards and downwards, till very gradually it formed a cloudy pillar extending from his shoulder to his feet and close to his body. Then he shifted himself a little sideways, the cloudy figure standing still, but appearing joined to him by a cloudy band at the height at which it had first begun to form. Then, after a few minutes more, Monk again said "Look," and passed his hand through the connecting band, severing it. He and the figure then moved away from each other till they were about five or six feet apart. The figure had now assumed the appearance of a thickly draped female form, with arms and hands just visible. Monk looked towards it and again said to us "Look," and then clapped his hands. On which the figure put out her hands, clapped them as he had done, and we all distinctly heard her clap following his, but fainter. The figure then moved slowly back to him, grew fainter and shorter, and was apparently absorbed into his body as it had grown out of it. We will see in my next post that this type of astonishing thing has been reported very many times by observers such as Schrenck-Notzing, who thoroughly documented all of his observations and published many photographs of them. (1) A female figure in white came out between the curtains with Mrs. Ross in black, and also a male figure, all to some distance in front of the cabinet. This was apparently to demonstrate, once for all, that, whatever they were, the figures were not Mrs. Ross in disguise. (2) After these had retired three female figures appeared together, in white robes and of different heights. These came two or three feet in front of the curtain. (3) A male figure came out, recognized by a gentleman present as his son. (4) A tall Indian figure came out in white mocassins; he danced and spoke; he also shook hands with me and others, a large, strong, rough hand. (5) A female figure with a baby stood close to the entrance of the cabinet. I went up (on invitation), felt the baby's face, nose, and hair, and kissed it—apparently a real, soft-skinned, living baby. Other ladies and gentlemen agreed. Directly the séance was over the gas was lighted, and I again examined the bare walls of the cabinet, the curtains, and the door, all being just as before, and affording no room or place for disposing of the baby alone, far less of the other figures. In the description above one of the mysterious figures is described as recognized by one observer as his son, apparently his deceased son. Wallace notes that the doors ("fastened with sticking plaster" that would be disturbed if someone opened them) were "just as before," indicating no one had gone through the doors. at length I recognized the likeness to a photograph I had of my cousin Algernon Wilson, whom I had not seen since we were children, but had long corresponded with, as he was an enthusiastic entomologist, living in Adelaide, where he had died not long before. Then I looked pleased and said, "Is it Algernon ?" at which he nodded earnestly, seemed very much pleased, shook my hand vigorously, and patted my face and head with his other hand. These two recognitions were to me very striking, because they were both so private and personal to myself, and could not possibly have been known to the medium or even to any of my friends present. 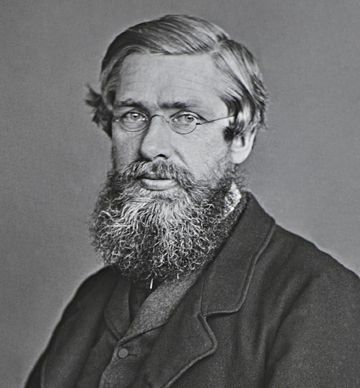 Clearly Alfred Russel Wallace was quite a ghost observer and ghost believer. It is amusing to consider a possible conversation between a mainstream biologist and a historian. Biologist: Please believe in Darwin's wonderful insight that natural selection and random mutations are the cause of all biological wonders. Historian: You forgot to mention that this theory was co-founded by Alfred Russel Wallace, and some think he first came up with it. Biologist: I don't care who thought of it first – just believe it. Historian: It is interesting that the co-founder of the idea of evolution by natural selection believed in ghosts and reported some astonishing apparition sightings he personally saw. Biologist: Well, don't believe him about that! Historian: And also Wallace said natural selection could not explain the human mind, that it must have resulted from the guidance of some superior intelligence. Biologist: Don't believe him about that either. Much better to believe that natural selection explains it all. Historian: So what are you saying – that I should believe very strongly what Alfred Russel Wallace taught about animals, but I should not believe what he taught about humans and ghosts? 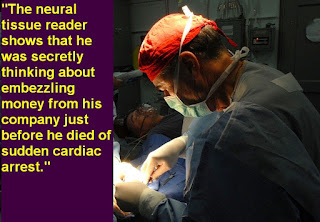 In the third and last in this three-part series, which you can read here, I discuss how a Nobel prize winner in Medicine and Physiology reported seeing the appearance of a mysterious phantom, and how abundant further observations by others tended to corroborate his report. On one occasion Home was the medium and Mr. (now Sir William) Crookes was present. As I was the only one of the company who had not witnessed any of the remarkable phenomena that occurred in his presence, I was invited to go under the table while an accordion was playing, held in Home's hand, his other hand being on the table. The room was well lighted, and I distinctly saw Home's hand holding the instrument, which moved up and down and played a tune without any visible cause. On stating this, he said, "Now I will take away my hand"—which he did; but the instrument went on playing, and I saw a detached hand holding it while Home's two hands were seen above the table by all present. This was one of the ordinary phenomena, and thousands of persons have witnessed it; and when we consider that Home's séances almost always took place in private houses at which he was a guest, and with people absolutely above suspicion of collusion with an impostor, and also either in the daytime or in a fully illuminated room, it will be admitted that no form of legerdemain will explain what occurred. But the sequel was still more striking, for Mr. Home then removed his hand altogether from the accordion, taking it quite out of the cage, and placed it on the hand of the person next to him. The instrument then continued to play, no person touching it and no hand being near it. The accordion in question was one Crookes had bought himself, and this was when the world had no such invention as a self-playing accordion. In the same book, Crookes on page 92 lists self-luminous hands as Class IX among 13 paranormal phenomena he has observed, listing something similar to the "detached hand" described by Wallace. For more about Crookes' observations of the paranormal, read here. If you bring up the topic of paranormal activity as dramatic as levitation or ghosts to the average scientist, you might well get some claim along the lines of: while individual witnesses may have claimed to have seen such a thing, nothing like that has ever been observed by a scientist under controlled conditions. Such a statement is actually not at all true. Paranormal activity as dramatic as levitation and spectral appearances have been observed by some famous scientists under controlled conditions. The most reliable way for us to get evidence of such things is to read an account written very close to the time of the alleged occurrences, preferably by the person who observed them. We have such an account in writings of Sir William Crookes, an eminent scientist of the nineteenth century. Crookes did fundamental investigations into cathode rays that helped to pave the way for the later invention of television. He also discovered the element thallium. If the Nobel Prize for physics had existed in his time, Crookes would probably have won it. Crookes' first hand account of his observations of the paranormal is found in his 1874 book Researches in the Phenomena of Spiritualism, which is available online at this link. Below are some relevant passages. Among the remarkable phenomena which occur under Mr. Home's influence, the most striking, as well as the most easily tested with scientific accuracy, are –(1) the alteration in the weight of bodies, and (2) the playing of tunes upon musical instruments (generally an accordion, for purposes of portability) without direct human intervention, under conditions rendering contact or connection with the keys impossible. Not until I had witnessed these facts some half-dozen times, and scrutinised them with all the critical acumen that I possess, did I become convinced of their objective reality. I and two of the others present saw the accordion distinctly floating about in the cage with no visible means of support. This was repeated a second time, after a short interval. I tested with a weighing machine the phenomenon on two subsequent occasions when I had an opportunity of meeting Mr. Home at the home of a friend. On the first occasion, the increase of weight was from 8 lbs normally, to 36 lbs, 48 lbs, and 46 lbs, in three successive experiments tried under strict scrutiny. On the second occasion, tried about a fortnight after, in the presence of other observers, I found an increase of weight to be from 8 lbs to 23 lbs, 43 lbs, and 27 lbs, in three successive trials, varying the conditions. Clearly Crookes claim of a paranormal alteration in the weight of an object was not some kind of fuzzy impression but instead a carefully measured result involving a dramatic variation of up to 600%. These experiments confirm beyond doubt the conclusions at which I arrived in my previous paper, namely, the existence of a force associated, in some manner not yet explained, with the human organisation, by which force, increased weight is capable of being imparted to solid bodies without physical contact. The most striking cases of levitation which I have witnessed have been with Mr. Home. On three separate occasions have I seen him raised completely from the floor of the room. Once sitting in an easy chair, once kneeling on his chair, and once standing up....There are at least a hundred recorded instances of Mr. Home rising from the ground, in the presence of as many separate persons. Does this qualify as a ghost sighting? While ghost sightings often involve reports of full human forms, in many ghost sightings it is reported that only part of a human was seen, perhaps only half a body or an arm or hand. We can define a ghost as a human form, full or partial, that appears and disappears mysteriously. Under that definition, the account just quoted qualifies as a ghost sighting (and I will soon cite much more dramatic cases). A dark, shadowy, semi-transparent form, like that of a man, was then seen by all present standing near the window, waving the curtain with his hand. As we looked, the form faded away and the curtain ceased to move. The climax of the book is the sensational case of Florence Cook, who was a teenage girl Crookes tested extensively at his own home in 1874, after numerous observers had reported in 1873 astounding inexplicable phenomena connected with her. Cook repeatedly seemed to produce what is called a full-form materialization. In a typical occurrence, Cook would go into what is called a “cabinet,” but which was typically just a small area of a room closed off by a curtain. There would then mysteriously emerge a seemingly different figure who identified herself as Katie King. Katie King kept showing up numerous times in the sessions at Crookes' home, until May 21, 1874 (previously announced by her as the last day she would appear). Could this figure have simply been Florence in disguise? Some observations of Crookes conflict with such a claim. On page 104 he states, “When Katie was outside the cabinet, standing before me, I heard a moaning noise from Miss Cook in the cabinet.” On page 105 he says not more than three seconds passed between him seeing Katie in a white robe and seeing Florence Cook in black clothes. On page 107 Crookes recalls seeing Katie and Florence in separate places of the room. On that page he also notes physical differences between the two, such as: Katie being between four and a half inches taller and six inches taller than Florence (even though Katie was barefoot and not tip-toeing); Katie having a very fair complexion that differed from Florence's dark complexion; and Katie having much longer fingers than Florence, and a much larger face. The numerous people seeing Katie King (such as Crookes) reported her being barefoot, so the substantial difference in height between Katie and Florence (also reported by other sources) seemingly rules out the idea of Florence masquerading as Katie. Using the exact parapsychology terminology, we would call Katie King a “full-form mediumistic materialization,” but using my previous definition of a ghost (as a human form, full or partial, that appears and disappears mysteriously), we can call Katie King a ghost. Crookes took some clear photographs of the mysterious figure, which can be seen by doing a Google image search for "Katie King." The image below is from this archive. Crookes notes on page 111 that Florence Cook agreed to every test he proposed, and that "I have never seen anything approaching the slightest symptom of a wish to deceive." To the special question which you put regarding my experiences of the materialization of the spirit-form, with Miss Cook's mediumship, I must reply that, after two years' examination of the fact and numerous séances, I have not the smallest doubt, and have the strongest conviction, that such materialization takes place, and that not the slightest attempt at trick or deception is fairly attributable to any one who assisted at Miss Cook's séances. Whatever Katie King was on the evening of the 9th of May , she was not Miss Cook. To that fact I am ready to take my most solemn oath. She repeated the same experiment with me on the 13th, and on that occasion we had the benefit of mutual sight also, as the whole company were invited to crowd around the door whilst the curtain was withdrawn and the gas turned up to the full, in order that we might see the medium, in her blue dress and scarlet shawl, lying in a trance on the floor, whilst the white-robed spirit stood beside her. The average reader probably has never heard of any of these cases, although he or she may have read numerous articles on the topic of ghosts. What we must remember is that when mainstream thinkers discuss the paranormal, they usually keep us in carefully filtered information bubbles, hiding from us all the better cases of paranormal phenomena. There is a slogan “history is written by the winners.” Gaining predominance in universities, today's dogmatic professors are the winners who present their own biased accounts of what happened long ago, passing everything through the distortion prism of their own prejudices. To find out what actually happened decades or centuries ago, always go back to the original accounts of those who witnessed things. In the next part of this three-part series of blog posts, I will report on some ghost accounts perhaps even more astounding than those reported by Crookes. Interestingly, the reports I will discuss were made by an eminent scientist who was one of the two co-founders of a theory that is supported with great zeal by the type of people who are least likely to believe in ghosts. Part 3 of this 3-part series can be read here. Mr. Luxmore requested me to make a careful examination of the cords, knots and seals. All were intact, and when he asked me to cut the bands I could hardly introduce the scissors beneath them, so tightly were the hands tied. My confidence in the genuineness of this manifestation is absolute. Further testimony to the reality of the Katie King apparition or materialization can be found in Chapter XVI of the interesting book There Is No Death by Florence Marryat, which can be read here or here. Marryat says on page 140 that Katie King was sometimes much taller than Florence Cook. She says on page 141: "I have seen both Florrie and 'Katie' together on several occasions, so I can have no doubt on the subject that they were two separate creatures." Then three gas-burners were turned on to their full extent in a room about sixteen feet square. The effect upon "Katie King" was marvellous. She looked like herself for the space of a second only, then she began gradually to melt away. I can compare the dematerialization of her form to nothing but a wax doll melting before a hot fire. First, the features became blurred and indistinct; they seemed to run into each other. The eyes sunk in the sockets, the nose disappeared, the frontal bone fell in. Next the limbs appeared to give way under her, and she sank lower and lower on the carpet like a crumbling edifice. At last there was nothing but her head left above the ground—then a heap of white drapery only, which disappeared with a whisk, as if a hand had pulled it after her—and we were left staring by the light of three gas-burners at the spot on which "Katie King" had stood. “Tell us a story, Daddy,” said the daughter. The father had just created a nice fire. He was sitting next to it with his son and daughter. They were inside their igloo. The father and son were taking a rest after a hard day of ice fishing out in the icy, frozen wilderness. “Is it a true story?” asked the son. “Tell it to us, Daddy,” said the daughter. “So it was kind of like a paradise?” asked the son. “That's pretty hard to believe – kind of like a fairy tale,” said the daughter. “Why would that happen?' asked the daughter. “Oh come on, Daddy – how could the world ever become too hot?” asked the daughter. She had known only an icy, frozen planet in the grip of a perpetual winter. “What did they do?” asked the son. “What happened to all the people?” asked the daughter. “So that's why people like you and me have fur all over our bodies?” asked the daughter. 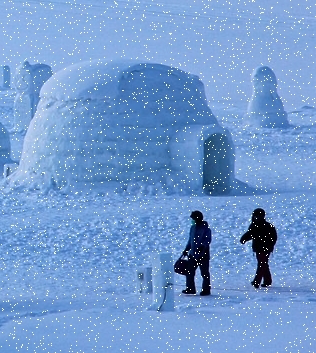 The next morning the father and the son went out again to spend the day ice fishing, once again drilling a hole in a frozen pond. “So who do you think was smarter, people like us or those weird people long ago who had those ugly bodies without any fur all over their faces?” asked the son. In 2014 millions of people watched the television series “Cosmos: A Spacetime Odyssey” hosted by Neil deGrasse Tyson. Since this TV series was heavily promoted by a host of science-related websites, the viewers of the series must have thought they were seeing nothing but solid factual science. But episode 2 of the series (entitled “Some of the Things That Molecules Do”) contained some large errors of fact and logic which we can find by looking at this transcript. If artificial selection can work such profound changes in only 10,000 or 15,000 years, what can natural selection do operating over billions of years? The answer is all the beauty and diversity of life. If wind erosion can produce a 1% deformation in something in 10 years, how much of a deformation might wind erosion produce in 500 years? Easily 20% or more. If non-blind painters can produce 100 portrait masterpieces in 200 years, how many portrait masterpieces might blind painters have produced in 500 years? Easily hundreds. To the contrary of what Tyson claims, there is a very strong reason why we cannot explain any complex biological innovations merely by saying they were the result of natural selection. The reason is that natural selection never occurs in regard to some complex biological innovation until after it has appeared. Once a new biological innovation occurs, it may result in an increased reproduction rate or increased survival rate in the organisms with that biological innovation. But such a thing (a natural selection effect) never occurs in regard to some biological innovation until after that biological innovation appears. So natural selection can never be the cause of a very complex biological innovation. You don't explain something by referring to something that occurred after that thing appeared. DNA is a molecule shaped like a long twisted ladder or double helix. The rungs of the ladder are made of four different kinds of smaller molecules. These are the letters of the genetic alphabet. Particular arrangements of those letters spell out the instructions for all living things, telling them how to grow, move, digest, sense the environment, heal, reproduce. This is a very big misstatement. Our DNA does not tell a fertilized ovum how to grow to become a baby, does not tell us how to move, does not tell us how to sense the environment, and does not tell us how to reproduce. It is not even metaphorically correct to make the statement quoted above, because DNA does not contain a human body specification. There is no layout or specification of a human bone structure or human limbs in DNA, nor is there any layout of the human eye or ears, nor is there any layout or specification of the human reproduction system. DNA is neither a blueprint nor a recipe for making a human (see the end of this post for quotes by several scientists clarifying that DNA is no such thing). DNA does not contain any instructions telling a fertilized egg how to progress to become a human baby. How do we know that DNA has no such things? The first reason is that no such blueprint or recipe has been found in human DNA, even though it has been exhaustively analyzed by major multi-year science projects such as the Human Genome Project and the ENCODE project. The second reason is that the expressive limitations of DNA prevent it from ever expressing such complex information. Tyson refers to “the letters of the genetic alphabet.” The way that this alphabet works is that the only things that can be spelled out in such a language are amino acids. Below we see the genetic code used by DNA. 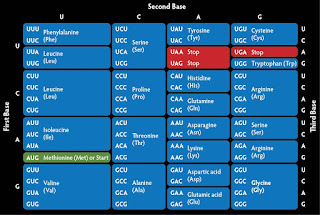 The U, C, A and G in the table are the “four letters of the genetic alphabet” Tyson referred to. 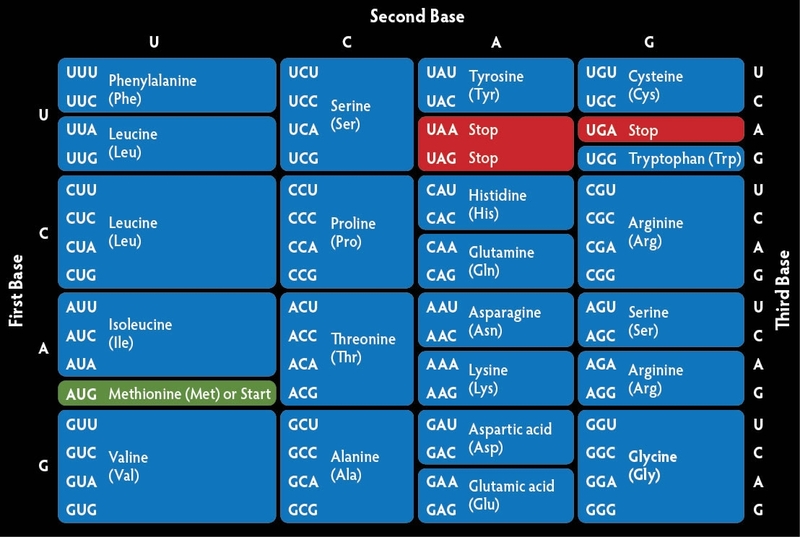 But as the table makes clear, the only things that can be spelled out with this genetic alphabet are amino acids (such as proline and valine) that are the ingredients of proteins. DNA is therefore merely a repository of chemical information. It is not some blueprint or recipe for making a human, and its structural limitations prevent it from being such a thing. Consider a traffic light. A traffic light is an information system capable of presenting only three items of information: the messages “STOP,” “GO,” and “CAUTION.” Just as the physical limitations of a traffic light greatly limit the type of information it can present, the physical limitations of DNA greatly limit the type of information it can present, limiting such information to be only chemical information rather than complex structural biological information. The shapes and structures of complex three-dimensional organs and organ systems cannot possibly be expressed in DNA given the limitations of the genetic code, nor can complex assembly instructions such as would be needed to specify how to create a human body. A third reason why Tyson cannot be correct in saying that DNA is something that contains “the instructions for all living things, telling them how to grow, move, digest, sense the environment, heal, reproduce” is that if DNA were to contain such information, which would be fantastically complex instructions, there would be nothing in a human womb capable of understanding instructions so complex. A blueprint dumped at a construction site (containing lumber, nails, bricks, mortar, copper wire and pipes) doesn't cause a building to be built. The building is only built because there are agents smart enough to read and understand the blueprint and act on its instructions. But we know of nothing at all in a human womb that would be capable of reading and understanding incredibly complex instructions for making a human if they were in DNA. Wombs don't have brains or minds. So how is it that humans are able to reproduce? How is that a fertilized ovum is able to progress to become a full-sized baby? That is a gigantic mystery of biological life that we don't understand. The reality that DNA does not specify body plans or a recipe for making an organism is a fact that contradicts and smashes all attempts to explain a progression of earthly life forms merely by citing a progression of genomes, which is exactly the faulty explanation that Tyson relies on. But regardless of whether it did occur, a possibility such as the one Tyson has mentioned is not terribly improbable. Such a thing is called microevolution, a small change in an organism that does not involve any complex innovation. Microevolution does indeed sometimes occur. You can get a rough idea of the likelihood of a favorable random mutation by considering the case of a monkey at a keyboard. If you are an average typist with about a 1% typing error rate, and you bring in a monkey to randomly strike a key on your keyboard, the chance of that random keystroke improving your text is about this 1% figure multiplied by the number of keys on the keyboard. This gives a probability of about 1 in 3000. Similarly, a random mutation in DNA might have something like 1 chance in 3000 of producing some tiny improvement that natural selection might favor. But what's the chance of getting a new functional protein from random mutations? The chance of this is exponentially smaller. An average protein consists of about 200 amino acids arranged in just the right way to achieve a particular functional effect. There are 20 amino acids in the genetic code. A protein with 200 amino acids might have its amino acids arranged in 20 to the 200th power ways (20200 ways), and only a microscopic fraction of these would be functional. Similarly, there are roughly 30 to the 200th power ways in which a typing monkey might type random text (30200 ways), and only a microscopic fraction of these would be meaningful useful instructions. So while it is not terribly improbable that a typing monkey might produce a keystroke that improves your written text (such a thing having a probability of about 1 in 3000), it is almost infinitely more improbable (more than a trillion quadrillion quintillion times more improbable) that a typing monkey might produce a usable 200-word computer program. And similarly, while it is not all that improbable that a single mutation might produce some small improvement in a genome, it is almost infinitely more improbable (more than a trillion quadrillion quintillion times more improbable) that random mutations might conspire to produce a protein of 200 amino acids arranged in just the right way to produce some novel functional effect. Given a billion typing monkeys across the globe hitting typewriter keys for a billion years, we would not expect any of them to produce a functional 200-word computer program; and given five billion years of random mutations across the globe, we would not expect a functionally useful new protein of 200 amino acids to appear by such chance mutations. The human genome contains genes for about 20,000 such proteins. In the beginning, life was blind. This is what our world looked like four billion years ago, before there were any eyes to see. Until a few hundred million years passed, and then, one day, there was a microscopic copying error in the DNA of a bacterium. This random mutation gave that microbe a protein molecule that absorbed sunlight. Of course, this is utter nonsense. A random mutation changes exactly one nucleotide base pair in DNA, and its effect is never greater than changing or adding one particular amino acid in a protein. But proteins are made of hundreds of amino acids arranged in just the right way to achieve a functional effect. If a light-absorbing protein molecule had appeared by random mutations, this would have required a fantastically improbable conspiracy of random mutations occurring over millions of years. But Tyson has told us that “one day” such a functional molecule has appeared, because of a single random mutation. This is as crazy as someone saying that a monkey could produce a 200-character functional new computer program by typing a single keystroke (or an intelligible 50-word recipe by typing a single keystroke). The molecular complexity of proteins was unknown to Darwin, who also knew nothing of the complexity of the cell. Proteins are a great embarrassment to all who would claim that humans are the result of blind forces. Our bodies are built of many thousands of proteins, but scientists have no credible accounts for the origin of any protein, and each is as complex a piece of functionality as a 200-word computer program. A mainstream scientific paper says, "A wide variety of protein structures exist in nature, however the evolutionary origins of this panoply of proteins remain unknown." Here's a flatworm's-eye view of the world. This multi-celled organism evolved a dimple in the pigment spot. The bowl-shaped depression allowed the animal to distinguish light from shadow to crudely make out objects in its vicinity, including those to eat and those that might eat it a tremendous advantage. Later, things became a little clearer. The dimple deepened and evolved into a socket with a small opening. Over thousands of generations, natural selection was slowly sculpting the eye. Tyson is using here a standard strategy for those trying to suggest that vision systems could have appeared accidentally: start out by mentioning the tiniest visual structure you can imagine, and hope that people regard this as something very simple that could have easily appeared accidentally. But if you were to delve into all the microscopic details and biochemistry details, you would find that this tiny thing is actually extremely complex. Cells are very tiny, but they have functional complexity so great they have been compared to small cities. There are 1000-page books devoted to nothing but describing the complexity of cells. And the flatworm organ Tyson refers us to is much more complicated than a cell. Flatworms have primitive light-sensing structures called ocelli. In the quote above Tyson implies that first we had the fairly primitive ocelli of the flatworm, and then much later we had the first real eyes. 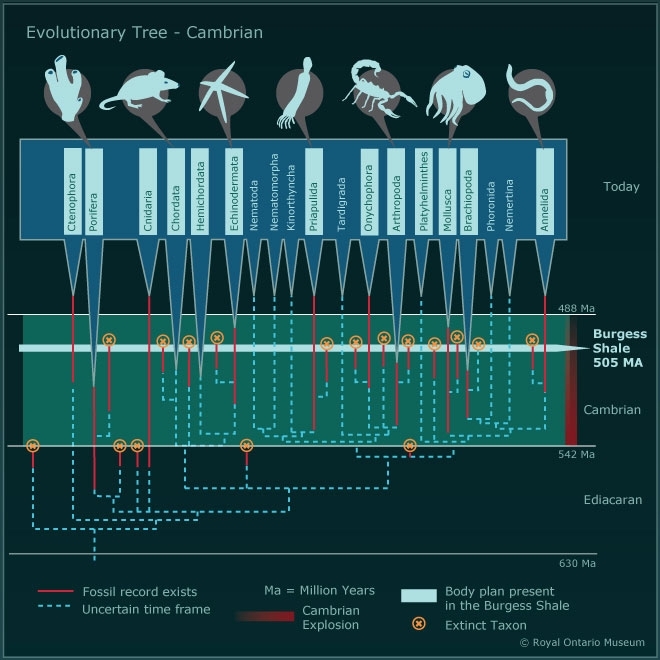 This does not match what the fossil record tells us. Animals with the primitive ocelli of the flatworm do not appear earlier in the fossil record than animals with complex eyes. 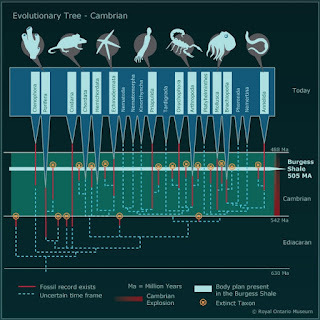 Both the flatworms and many types of animals with eyes are believed to have first appeared at the time of the Cambrian Explosion in which most of the animal phyla rather suddenly appeared, contrary to what we would expect from Darwinian gradualism. There is no fossil record of any primitive eyes that appeared before the first complex eyes in the fossil record, and which are believed to be the predecessors of species with complex eyes. The visual above (from this mainstream science web site) shows the situation. The flatworms are the Platyhelminthes. Fish with eyes appeared in the phylum Chordata, the same phylum of humans. There is no evidence of fish descending from flatworms, and no evidence that the first animals with good eyes descended from flatworms (contrary to what Tyson has insinuated). What difference does it make whether a light-sensitive patch of an organism is sufficient to provide a crude, blurry form of vision, rather than merely telling an animal which direction is up and down? It makes a very great difference to the question of whether we can reasonably imagine a gradual evolution of an eye from a primitive light-sensitive patch. If a light-sensitive patch and the tiniest brain (like a flatworm has) is sufficient to produce crude vision, then we can imagine that each additional change leading up to an eye producing clear vision was a change producing a benefit to the organism that had such a change. If, on the other hand, a light-sensitive patch and the tiniest brain is not sufficient to produce vision, then we have to imagine many additional changes in the eye region and brain occurring without producing any reward, until finally after many required changes there occurred the late reward of functional vision. The latter scenario is one that is not credible under Darwinian assumptions. There is no reason why natural selection would make a whole bunch of changes to produce a vision system unless there was a continual reward for each change in such a series of changes. But it very frequently happens (inside of biology and outside of it) that there is no continually rewarded path leading to a new complex innovation, and no reward comes until many changes are made, and many parts are arranged in just the right way. Such “late reward” scenarios are far more common than “continual reward” scenarios, a fact that constantly stymies and short-circuits explanations of the type Tyson is trying to make here. On the protein level, the origin of every functional protein is a “late reward” scenario (halves of a protein molecule being non-functional), so in the human genome with genes for some 20,000 proteins, we have some 20,000 “late reward” scenarios that all defy attempts to explain them by imagining some continually rewarded Darwinian path. What Tyson has done is to paint a speculative picture of continually rewarded evolution from a primitive light-sensitive patch (supposedly producing crude vision) to an eye. The scenario is not supported by the fossil record, and is not credible because light-sensitive patches on organisms like flatworms do not at all produce crude vision. And when we delve down to the protein level, we find that even this supposedly primitive light-sensitive patch would require a very high state of functional amino acid organization most unlikely to ever appear by chance. Based on these numerous misstatements and misleading impressions, Tyson claims, “The complexity of the human eye poses no challenge to evolution by natural selection.” To the contrary, there is no complex biological innovation that can plausibly be explained by natural selection, which never occurs in regard to a biological innovation until after that innovation occurs. Tyson has reached his reassuring “we got this” conclusion by engaging in various cheats large and small, including the gigantic whopper of claiming that a light sensitive protein might originate on a single day, the crucial misstatement suggesting DNA is a recipe for making an organism, the unfounded suggestion that the first advanced eyes evolved from primitive eyes (which the fossil record does not support), and the erroneous idea that mere light-sensitive patches like those in flatworms produce a crude form of vision. Once we realize that genotypes do not specify phenotypes (merely influencing them), and that DNA does not and cannot store body plans, the legs are pulled from out of the Darwinist explanation for complex biological innovations such as eyes. Since DNA does not actually store the extremely complex structural arrangement of a vision system, there is no way that vision systems could have appeared through any imaginable modification of DNA, whether it be random mutations or anything else. Near the end of the Cosmos episode, Tyson claims that scientists are “not afraid to admit what we don't know.” To the contrary, many of them seem to not at all know what they do not know, and to think that they know very much more than they do know. The typical modern scientist claims that he understands the origin of complex visible biological innovations, but admits that he does not understand the origin of life itself or the mysteries of morphogenesis and embryonic development. It makes no sense to claim that you understand the first of these things without understanding the last two of these things, since there is every reason to suspect that all three are produced by similar causal factors. Man's knowledge of nature is fragmentary, and the mere fragments we have (like ten or twenty pieces of a 400-piece jigsaw puzzle) are not sufficient to allow us to answer biological origins mysteries that may take mankind a thousand years to unravel. It's no sin for a scientist to act like some “Wheel of Fortune” very-early-guesser who guesses the answer after only three or four of the 30 letters have been turned; but such guesses should not be passed off as established truth. Tyson is one of many scientists who feed us similar origins baloney. Very recently the Science Daily web site (using a Stanford University press release) had a news article entitled, “Why deep oceans gave life to the first big, complex organisms.” The article dealt with the great mystery of why most of the known animal phyla suddenly appeared in the Cambrian Explosion, in a vast explosion of organization and functional information that included the first animals with vision systems. We are told in the last paragraph of the article that the explanation offered by an assistant professor Sperling is simply that the temperature at the bottom of the ocean was right for this. Sperling says, “The only place where temperatures were consistent was in the deep ocean. That's why animals appeared there.” This is reasoning on the same inane level as trying to explain the appearance of ten extraterrestrial monsters in your local swimming pool on Labor Day by saying that the reason the ten monsters suddenly appeared was that the water wasn't too hot or cold on Labor Day. This year the web site of the magazine Forbes has published credulous piffle about transhumanism, the belief that technology will create a new breed of enhanced humans. An example was the August 22 article by John Nosta entitled “It's Official, the Transhuman Era Has Begun.” The sole evidence offered to support for this claim was that a press release had been issued by some organization called Gartner, a press release claiming, “Over the next decade, humanity will begin its 'transhuman' era: Biology can then be hacked, depending on lifestyle, interests and health needs.” How naive is that, to assume that we have entered a new era because someone issues a press release making vague predictions that something will happen in the next ten years? Almost as credulous was another article on the Forbes site, issued on October 1 and entitled, “Human 2.0 Is Coming Faster Than You Think. Can You Evolve with the Times?” The article by Neil Sahota states, “The reality of transhumanism has not just caught on with the general public as a distinct possibility — it has become a living, breathing reality.” Sahota's evidence for the claim that we are on the brink of enhancing humans is merely stuff like the fact that Google has hired Ray Kurzweil, the fact that Elon Musk is spending some money on some company trying to make electronic links to the brain, and the fact that some country did the goofy act of giving citizenship to a robot. Knowing that tech mogul Paul Allen put many millions into a radio search for extraterrestrials that has not paid off, we shouldn't regard tech mogul investment as being much of a validation of something. But anyone willing to do a little math will figure out that what Vinge predicted in 1993 was that we will have “the technological means to create superhuman intelligence” by the year 2023, something that will almost certainly not happen, as we are nowhere close to doing such a thing. Sahota tells us, “Returning to Vinge’s prescience at the end of the 20th century, we can see he was imagining a future that would occur even sooner than he predicted.” To the contrary, he predicted superhuman intelligence by 2023, which will never happen. Think of how nutty this would be, if it occurred. Somehow acquiring the astronomical sums for such medical procedures, parents would be arranging for surgery on the brains of their children, filling their brains with wires that might have who-knows-what terrible side effects down the road, all so that their kids can use Google and a calculator without using their hands, and send instant messages without using their hands, which would seemingly be no progress at all since the same tools can be easily used today by anyone who wants to use his hands on a little smartphone in front of himself. There is currently no sound basis for believing that human intelligence or memory could be dramatically enhanced by technological means. Optimism about such possibilities comes from people with a very dubious philosophy of mind, the belief that the mind is a product of the brain, and that memories are stored in brains. See the articles at this site for many reasons for doubting both of these claims. But we can imagine something that might conceivably occur which would be an indication that transhumanist hopes are well-founded. I do not at all refer to current efforts that are sometimes inaccurately called examples of “mind reading software” or “mind reading machines.” Such software is actually merely engaging in neural perception prediction. For example, you can put someone's head in a brain scanner, and then try to figure out what the person is looking at by analyzing the contents of the part of the person's brain (such as the occipital lobe) involved in vision. Such efforts aren't actually “reading thoughts” or “reading minds” but simply picking up neural traces of visual perception. But I can imagine two different breakthroughs that might give evidence that transhumanist hopes are well-founded. The first breakthrough would be the ability to actually read the thoughts of someone who is merely thinking of random content with his eyes closed. So imagine if a person was able to randomly imagine a green rhinoceros, and to then think to himself, “A green rhinoceros would attract many visitors at a zoo”; and imagine that some brain reading machinery was able to tell that he had thought this exact thought that a green rhinoceros would attract many visitors at a zoo. And imagine that then the person had the completely random thought, picked out of nowhere, that a yellow flying car would be nice for flying to the tops of mountains, and that some brain scanning machinery was able to tell that he had had that exact thought that a yellow flying car would be nice for flying to the top of mountains. If such progress were made, it might be a sign that the hopes of transhumanists are well-founded, on the grounds that the brain really is the source of our minds. I can imagine another breakthrough that might give evidence that transhumanist hopes are well-founded. Imagine if we were able to use neural technology to read the memories of the living or the dead. One possibility might be that an animal might be trained by one scientist to fear some particular symbol such as a blue triangle or a red square or a purple circle. Then imagine that another scientist (who did not know which of 50 possible symbol/color combinations was used in the fear training) was then given the animal, and was able to figure out (by dissecting or scanning the animal's brain) which of the 50 symbol color/combinations had been used for the training. If such a thing was repeated many times with, say, a 70% success rate, this might be good evidence that memories are actually stored in brains. Another possibility is that memories might be extracted from the brains of a dead human. So after a person died, we might be able to somehow scan his brain, and determine his correct ATM pin number, or his computer password. That would presumably be good evidence that memories are stored in brains. Once you had such evidence, it then might be reasonable to speculate about school children downloading into their brains new school lessons, as transhumanists sometimes do. Nothing like these two things has ever happened. Neuroscientists have never got good evidence that brains produce thoughts, and have never got good evidence that memories are stored in brains. Neural tissue and synapses have been extensively examined at very high magnification with tools such as electron microscopes, but no signs of stored information have been found outside of the chemical information in DNA (present in all cells). There are many reasons for rejecting claims that brains make minds and store memories, such as the fact that the proteins in synapses have lifetimes of only a few weeks, and the fact that when epileptic children have half of their brains removed to stop seizures, there is little effect on memory or intelligence. If a scientist were able to do either of the things I have specified, we might call that scientist the Goddard of transhumanism. A century ago beliefs that humans would travel into space seemed in the realm of pure fantasy. 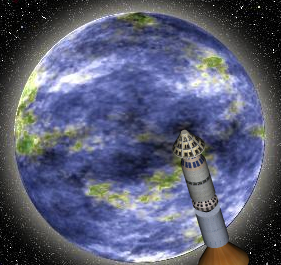 No one had any proof that rockets could even rise high in the atmosphere. Then Robert Goddard came along, and showed in the 1920's that rockets could indeed reach high altitudes, and that the ideas of space flight enthusiasts were on sound scientific ground. As soon as he did this successful “proof of concept” experiment, there was strong reason to think that men would one day travel in outer space. A Goddard of transhumanism would be someone who showed that the idea of electronically enhancing human intelligence is on sound ground, by showing that brains really do produce minds, or that brains really do store human episodic and conceptual memories. No such person has yet appeared, and if all the many reasons that exist for rejecting such claims are not pointing us in the wrong direction, no such person ever will appear. You can't do a “proof of concept” experiment when the concept involves an incorrect assumption.